The other classic. This again is as per the original. 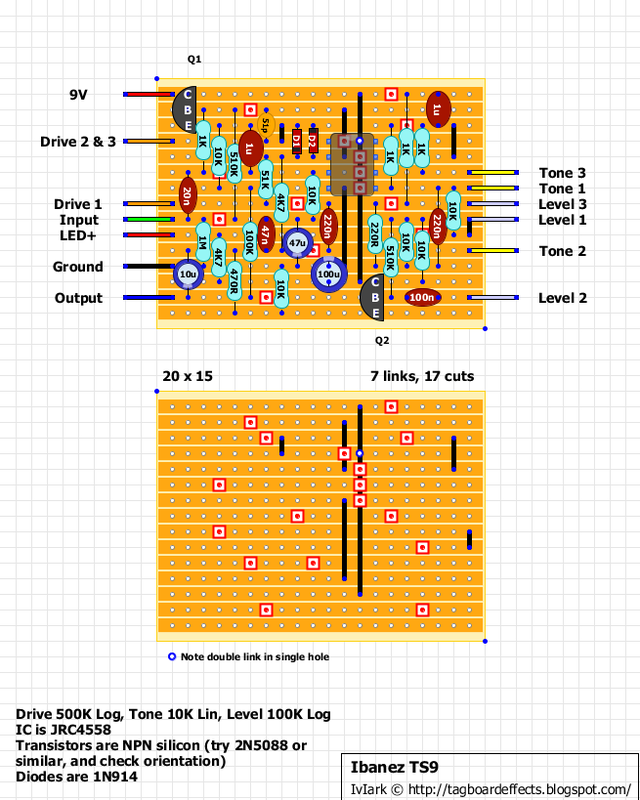 Note, the layout has been done with 2N5088 or 2N3904 transistors in mind and that matches the orientation shown. If you use anything else, check the required orientation for the transistors you use to make sure the pins are C B E from top to bottom. In my layouts, pin 1 will always be top left unless I note otherwise, and as far as I can remember I've only orientated ICs the other way once in the tap tempo daughter board, and in that case it was only because otherwise the two ICs would have needed to be linked diagonally right across the board. i've built it but i notice that sound is attenuated with level pot to half and only in the final part the sound is boosted. is it normal? try to put the transistor the other way around, it's shown the wrong way on the layout. 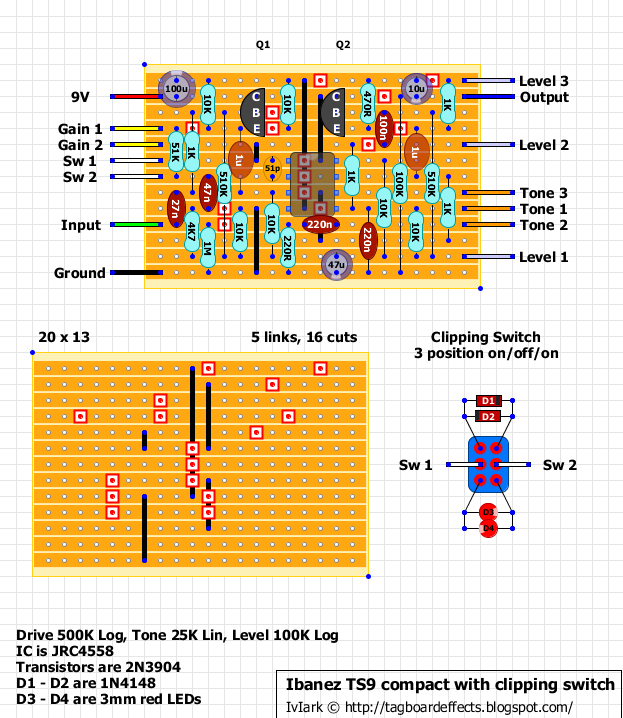 How does the LED+ connection work into the offboard wiring layout that you have on this site? Any help is appreciated! LED+ goes to the anode of the LED. The cathode then goes to the 3PDT and is switched to ground when the the effect is turned on which illuminates the LED. In the offboard wiring layout there is a resistor in series with the wire to the LED anode, but with this layout the resistor is already included on the board so you don't have to put a resistor "in line". If I wanted to take the LED out, do I just remove the 4k7 resistor? Tried disconnecting the LED, no effect, still popping. Also changed pulldown resistor values to a bigger one, no effect either. I think its not the pedal that causes popping. Hi everyone. I just built the version with external switch but cannot get it to work properly. In bypass mode signal goes through without any problem (no noise or hum). When I engage the effect, there is a volume drop and the signal is very weak. The led lights up, and tone, gain and volume controls do what they should, but all in a very weak and low signal. So basically everything works fine but the signal is lost through the cricuit. Already teste IC and the trannies on other circuit and they are ok.
Ok, I just checked and I have 9v everywhere (all IC and transistor pins). It's got to be a short, right? So something must be wrong with Q2. Any clues? Please, I need help and I need to learn. for clipping diodes, can you use germanium's? I have a few OA126's laying around and perhaps using sockets to play around with different diodes would be a good idea? You can use whatever diodes you want for clipping, as each one will have a different "flavor" of distortion. Changing from Si to Ge will usually cause you to loose some overall output, due to the lower threshold, usually ~.60V for Si and ~.30 for Ge. The only satay to combat that is to replace each single Si with 2 Ge's in that direction. My suggestion is to socket the diodes and start experimenting. You don't have to commit to one immediately, and you can always change them later if you change your mind. Oh, and Ge diodes are said to be warmer and smoother then Si diodes when clipped. my q1 b and e have 0 volts q2 voltages seem to be normal. When the effect is on I only get humming. What could be the problem? Just building this (the modded version) but where does gain 3 go to or is not connected? Thanks in advance. Ok built this a week ago and it sounds weird not what i was expecting. Checked build and everything seems fine. I am getting extreme fuzz but it breaks up almost immediately. I built the switch version. One thing i did wonder about was that 27n capacitor is it meant to be that value. I put a 22n and a 4n7 in parallel to get as close as i could. Could someone tell me if this 27n is correct? Should it be 47n or 22n and this is what is causing it too sound weird? Any advice would be greatly appreciated. 20n or 22n is the correct value depending on the version of the schematic. That is just the input capacitor and bigger value just lets a bit more low frequencies in to the circuit. That cap does not contribute to your symptoms, no matter what the value is used. Pins 1-3 and 5-7 should be close to "reference voltage", around 4,5 volts. Pin 4 should be zero and pin 8 should be the supply voltage, around 9V. Hi friends! At the minimum level of the DRIVE pot the signal is never clean...is it normal? how could solve this problem? I've tried this circuit vs. an original vintage ts9 and they are very different. the original has much more output volume and a much more "tube" response at low gain. Also the original has 20k tone pot and a 100k linear level pot. I used a RC4558P, in the original there is a TA75558P.....Transistors are K30A...What do you think about it? Ok came back to this one after a break to see if i could sort it out and again spotted it nearly straight away. Had one resistor end in a wrong hole. Amazing how many times you can look at something and you just can't see it. Anyway sounding a hell of a lot better. Get a dip in vol when diodes engaged but i presume thats normal due to the voltage drop. Works like a charm! Gratitudes lvlark!!! hi friends, if I read: 3.3v on pin2, 5v on pin5, 0v on pin6 & 7.. what should I do the first checker? thanks? and thanks for the layout..
Great pedal, but I am not getting any clipping from the red LEDs, it is like the switch is in the off position. When I swap them for other diodes, the switch works perfectly (I have put in sockets). So I have some excellent distortions, but am interested to hear the red LEDs clipping. Any ideas? Check if they are working with battery.I have bought some LEDs from tayda and the legs were very brittle. It looks like they are ok but at the top the legs might be broken. Built this effect, and it sound so great !!! I built the version with the clipping switch. It's great; distorts nicely. But I'm getting a significant volume drop from both clippings. What can I do? That's usually normal, the diodes and LEDs limit the volume. The diode lift position will be significantly louder. Built the stock version and I can really understand why this pedal is a classic! Thanks for the layout. do you have the original circuit diagram for this? the ts9 ones i've found on google seem different to this. Just finished, bypass sounds normal but when I engage the pedal I have a very low volume.. any advice? Try probing to see where it goes quiet? Hi and thanks for this layout! Just finished the modded build but I can't seem to get any clipping from the LEDs. It's just the same as the "centre lift" position. Any ideas why it would do that? Thanks!